Everyone forgets “where the hell” they put their keys. 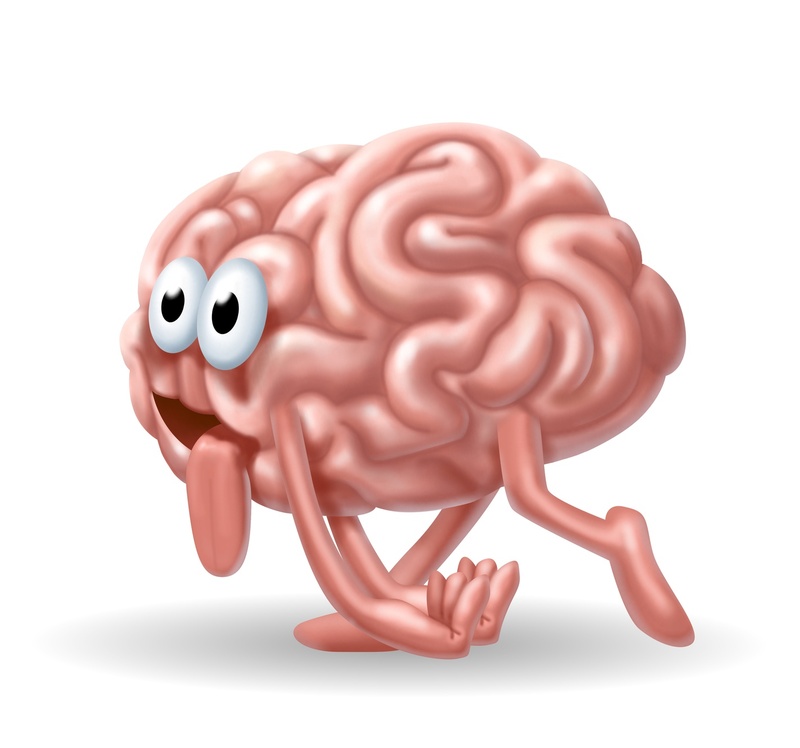 But such brain farts seem to occur increasingly over time, and eventually it’s not just your keys, but it’s your shoes & your wallet & your pants & your car & your dog & your pants & your this & your that, until one day–BAM!… Wait, what am I even talking about? 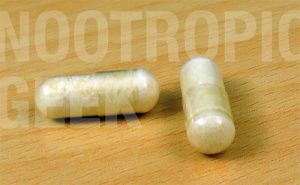 Oh yes, the nootropic review: Neuro Optimizer is here to reduce the brain farts while increasing the brainpower. Who Takes Jarrow Formulas Neuro Optimizer? Conclusion: Does Neuro Optimizer Work? 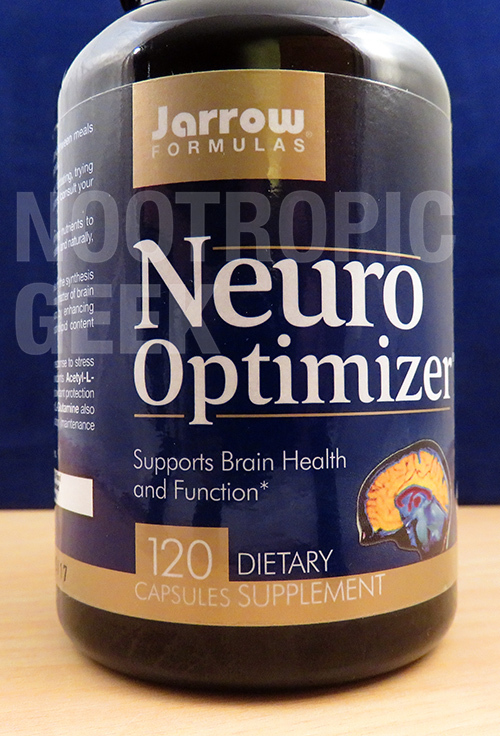 Jarrow Formulas Neuro Optimizer packs in “7 Neuro-Nutrients & Protectants” for immediate & long-term enhancements in brain health, power, & memory. Citicoline & Phosphatidylserine provide the heaviest punches in this formula, both backed by promising research & supplied in top quality forms. Neuro Optimizer optimizes various aspects of brain health. 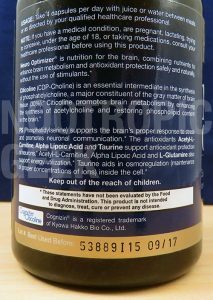 Bio-actions include: Enhancing brain metabolism, supporting brain chemicals, & protecting brain cells. Directions: Take 4 capsules per day with juice or water between meals or as directed by your qualified healthcare professional. Acetyl-L-Carnitine – While it’s particularly geared towards elderly mental health function, ALCAR shows brain energy promise for its ability to form & regulate neurotransmitters and support brain cell mitochondria. More on ALCAR. L-Glutamine – Used to create GABA, a “downer” neurotransmitter that reduces excessive excitatory neuroactivity for mood balancing effects. But I’m not sure it’s all that necessary in this formula. More on Glutamine. Believe it or not, Taurine is not sourced from bull testes. 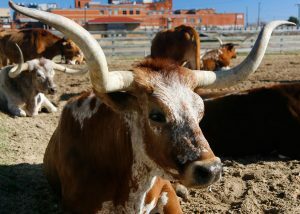 Taurine – Notable antioxidant with surprisingly significant sedative action on anxiety, while promoting sleep & relaxation. I say “surprisingly” because Taurine is overwhelmingly used in energy drinks. More on Taurine. 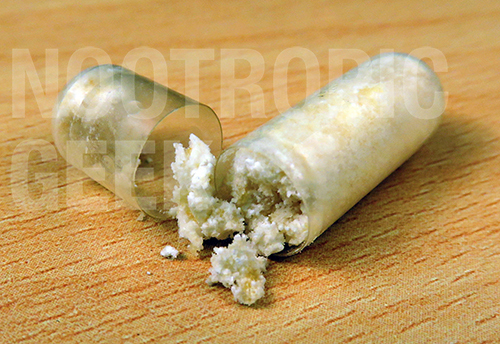 Cognizin – One of the best nootropics, if not the best, and in quality branded Cognizin® form. Citicoline supports brain energy, brain chemicals, & brain regeneration, and works really well as a whole-brain optimizer. More on Citicoline. Phosphatidylcholine – Essentially a nutritional choline donor used in the synthesis of acetylcholine, a neurotransmitter for memory & learning, as well as mood. Phosphatidylserine (Sharp-PS) – Backed by an FDA health claim, PS reduces brain toxin levels & maintains brain cell membranes for clear thinking & enhanced short-term memory. It is pretty great for brain regeneration. More on Phosphatidylserine. Alpha Lipoic Acid – Not necessarily a nootropic, but recognized as the “Universal Antioxidant” for its brain-protective antioxidant support. More on Alpha Lipoic Acid. If the Neuro Optimizer brand wasn’t so modest, I’d let the nootropic speak for itself. Which is all true, but doesn’t seem to paint the full picture. 7 Notable Stimulant-Free Nootropics – Mixing brain healthy cognitive boosters with brain healthy antioxidants & aminos–minus cheap caffeine & sugar. 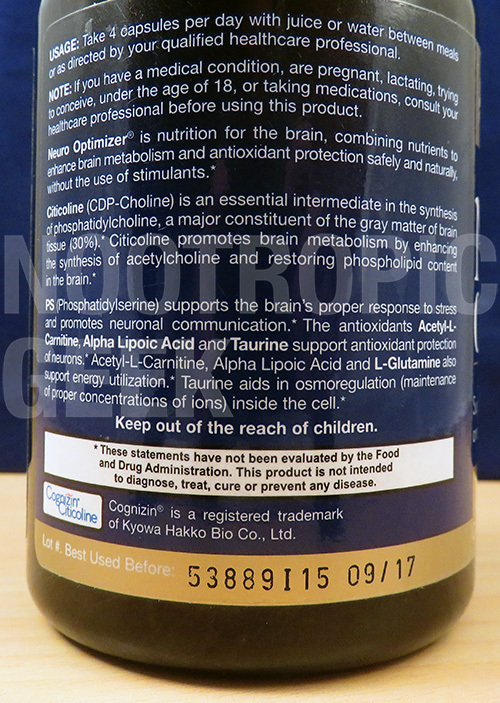 High Quality Brands – The Cognizin® (Citicoline) and Sharp-PS® (Phosphatidylserine) brands seem to indicate the overall quality of this formula. 2 Awards – Winning Better Nutrition Magazine‘s “Best of Supplements” (2011) and Vitamin Retailer Magazine‘s “Vity Award” (2010). And this is your brain not on Citicoline. 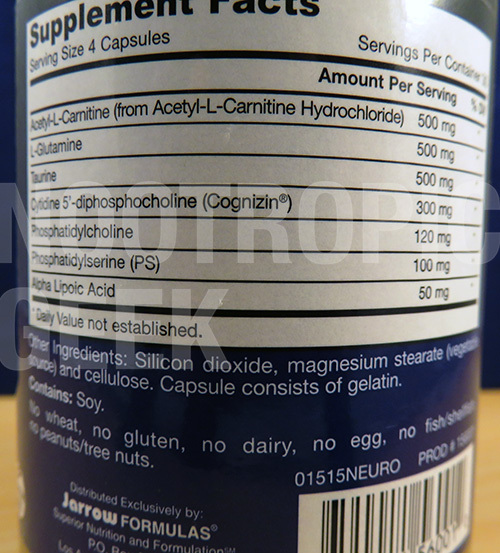 Combined, these qualities classify Jarrow Neuro Optimizer as a clean, reputable, well-designed nootropic stack, suitable not only for immediate boosts in cognition & brainpower, but for long-term mental aptitude. Considering the price as well, I could see this as a stack to start supplementing early for its neuroprotective advantages and continuing well into old age for its neurorestorative benefits. Consider Neuro Optimizer a Now & Later nootropic that’s better to start now than later. You had me at high-quality branded Citicoline + PS. These two nootropics alone are worth the investment in Neuro Optimizer. The simple, straightforward design & marketing not only looks clean, but leaves out all of the BS for simple, straightforward brain boosts. Better Nutrition Magazine & Vitamin Retailer Magazine also agree that this is a top, award-worthy nootropic stack. I read good customer reviews overall, though I bet a lot of them are Jarrow Formulas loyalists. Not that there’s anything wrong with that. Some of the doses on some of the ingredients (e.g. ALCAR) should be increased. Um… The serving size is 4 capsules, inducing a nasty side effect: heavy swallowing… Yeah, there aren’t many Cons with this product. Any age group looking for a little extra mental power may benefit from Neuro Optimizer, but Jarrow Formulas seems to primarily target the older ladies & gents, typically around the 50+ age range. You can buy Jarrow Formulas Neuro Optimizer through various supplement retailers, like iherb and amazon. It’s a relatively easy product to find in brick and mortar natural health food stores too. This is because Jarrow has been making health products for decades now — they have lots of shelf space. Neuro Optimizer supplies two major, researched-backed nootropics with brain-boosters that only increase with value the more you age. Compared to many other brain booster stacks that attempt attracting customers through flashy, over-complicated formula designs, Neuro Optimizer is a breath of healthy fresh air. 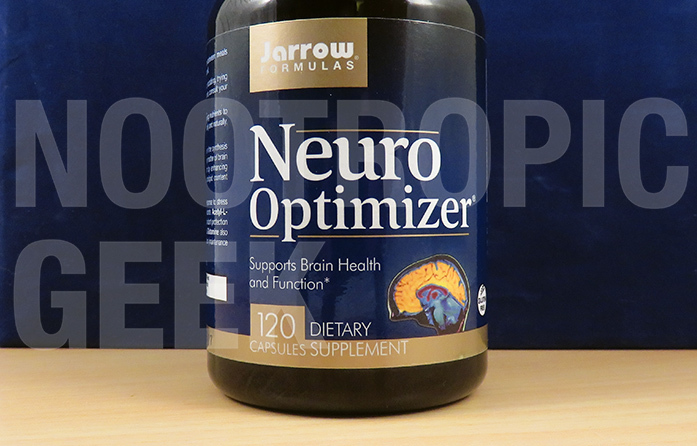 Not that Jarrow Formulas Neuro Optimizer covers all the bases on brain boosting with its short 7 ingredient formula, but it hits enough important pressure points to keep your mental processes in working order. Really cool site, I like it. I want to start my nootropic journey with this one. And I want to add N-Acetyl-L-Tyrosine. Will it be ok? Because I see this one Acetyl L-Carnitine in Neuro Optimizer. I think adding N-Acetyl-L-Tyrosine to this stack is a great idea. As far as I know, there’s no risk to mixing NALT and Acetyl L-Carnitine. Let me know how it works for you! I have more global question. About how to properly start with nootropics. For example, I start taking just single L-Tyrosine (Jarrow). And I feel a little headache (over eyes) and drowsiness. I’ll try more, so will be 100% sure that it is l-tyrosine. Also, 5 htp (Now brand) I took few weeks ago gave me hard wake mornings and small daily headache. But, if I buy Neuro Optimizer of Mind Lab for example and start taking it, how will I understand what gave me good or bad effect? It’s so many ingredients there. Do you have any method like adding nootropics step-by-step? Or maybe I can analyze (blood test etc.) my organism and make better decisions? Hi! I have add and i take Ritalin everyday do you know something about these Two combining togethere?